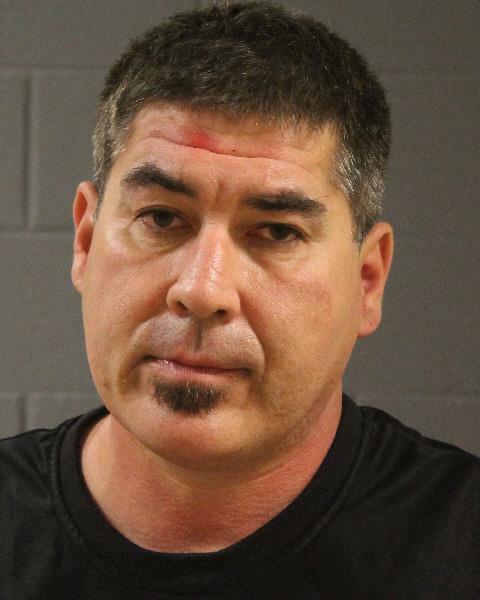 ST. GEORGE – A cluster of crashes kept St. George emergency responders busy on Bluff Street Saturday evening as three accidents happened in succession – one of them resulting in a DUI arrest. Calls regarding the first accident came in at 5:55 p.m., reporting that a collision had occurred at 700 South Bluff St. and that the occupants of the two vehicles involved were arguing. St. George Police responders were dispatched to the location but couldn’t find the accident, St. George Police Lt. Thad Feltner said. “While we were in the area circulating for the first crash, the second crash came out,” Feltner said. Farther up the road at 100 South and Bluff Street, the two vehicles that had been involved in the first accident were each involved in collisions with two other vehicles. Reports of the second accident came in at 5:58 p.m.
After the first crash, the two involved vehicles, a black Mercury Mountaineer and a green Honda Accord, had pulled into a nearby business parking lot. The man driving the Honda was attempting to exchange information with the man driving the Mercury and began arguing with him, Feltner said. The man in the Mercury left the scene and headed north up Bluff Street. “The Mercury was just trying to leave and get away from the driver of the Accord,” Feltner said. The Honda driver followed the Mercury up Bluff Street, trying to keep up with the vehicle and relay information to the Police Department at the same time. At that point, the Mercury crashed into a white truck that was stopped at the northbound red light at Bluff Street and 100 South. The Honda driver slammed on his brakes to avoid colliding with a silver passenger car that was also at that intersection, Feltner said, but the Honda nonetheless clipped the silver car. The Mercury driver was the only occupant of his vehicle, and he sustained minor burns from airbag deployment as a result of the second collision. The white pickup he hit contained a woman driver, her two children and the son of a friend. None of them were injured. “The children in the truck just complained of a little bit of aching,” Feltner said, adding that he believed they were mostly just stressed about having been involved in an accident. The occupants of the Honda and the silver passenger car it hit were not injured. The Mercury and Honda both had to be towed from the scene, Feltner said, while the white truck and silver passenger car were released to their owners and driven from the scene. The driver of the Accord was issued a citation for driving on a suspended license, Feltner said. “The driver of the (Mercury) Mountaineer was arrested,” he said. The man driving the Mercury, Brian Gregory Charles, of West Valley, was arrested and booked into the Washington County Purgatory Correctional Facility on charges of driving under the influence of alcohol, a class B misdemeanor; reckless driving, a class B misdemeanor; alcohol-restricted driver violation, a class B misdemeanor; operating a vehicle as a restricted driver without an ignition interlock system, a class B misdemeanor; leaving the scene of an accident, a class C misdemeanor; driving on a suspended license, a class C misdemeanor; and following too closely, an infraction. He was additionally booked on a cash-only warrant issued out of the North Salt Lake Justice Court. One northbound lane on Bluff Street was closed for about half an hour as emergency personnel attended to the accident scene and tow trucks responded, Feltner said. Just as responders had cleared the scene of the second accident, a third accident occurred at the same intersection: Bluff Street and 100 South. Then, a Jeep SUV traveling southbound on Bluff Street turned left to head east on 100 South. The third collision occurred at a relatively slow speed, he said, and nobody was injured, though both vehicles ultimately had to be towed from the scene. Fortunately, responders from the previous accident were still at the scene and were readily at hand to deal with the third incident. “Luckily enough, we had fire, medical and law – we were all there,” Feltner said. Once again, a northbound lane of Bluff Street had to be closed off while the accident was attended to. The woman driving the Jeep was issued a citation for failure to yield on a left turn. The St. George Police Department, St. George Fire Department and Gold Cross Ambulance responded to the accidents. I can’t even believe this. It’s not even that hot out. Here’s an idea. Get the guys license plate number and file a hit and run with the police. Viola! Problem solved. Or you could sink to his level and act like a fool. That works too. It’s amazing. Why are there so many accidents like this in southern Utah? I just got back from New York City and with all the cars and traffic they have, I did not see any accidents. Just mind boggling. It’s because in St. George everyone thinks that they are the only person who matters on the road. considering its st G. the odds are really good.